OAKLAND, CALIF. (KGO) — It’s a timely subject unfortunately and the Alameda Health System is taking the lead when it comes to preparing people for the unthinkable, like the mass casualty disaster or an active shooter. In Oakland, a Highland Hospital trauma nurse demonstrated how an ordinary citizen can stop the bleeding when someone has been seriously hurt. 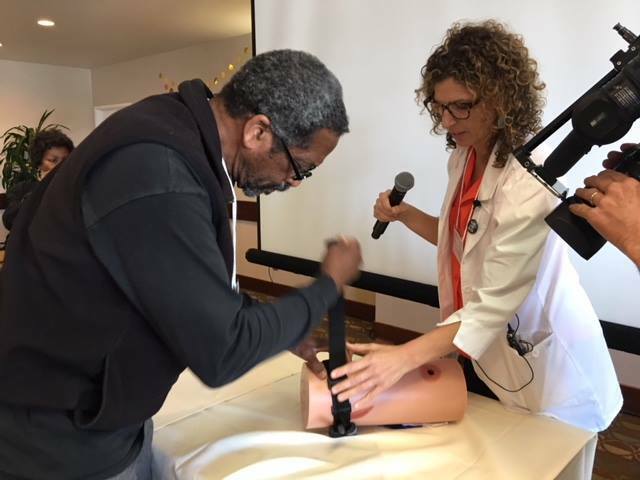 With mass casualty incidents fresh on the minds of many, the Alameda Health System is helping to teach people–not just health professionals–techniques to stop the bleeding after someone has been seriously injured or shot. The reality is when a bridge collapses or an active shooter is on the loose, the damage is often inflicted in a matter of seconds. As many as 35 percent of people who die before they get to a hospital…do so because of massive blood loss. “Whether it’s a single event or mass casualties from a natural disaster or a man-made disaster, those techniques of stopping a massive hemorrhage will literally save a life,” said Jim Morrissey, a paramedic who now works with the Alameda County Healthcare Services Agency and U.S. Homeland Security. Bottom line–it’s a well-trained citizen-responder who can make that difference…between life and death.